Building a better food future for world regions was the intention behind the first ever World Region of Gastronomy meeting, held fittingly in the first region to receive the IGCAT title of European Region of Gastronomy in 2016. 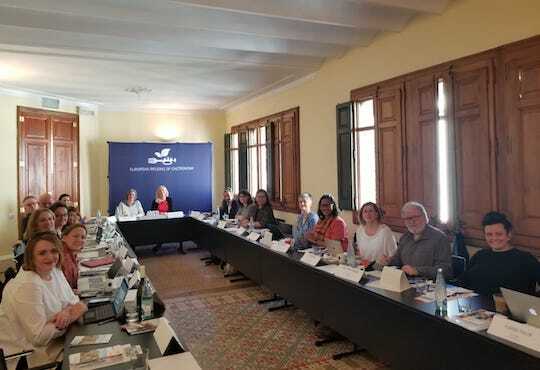 The meeting took place in the emblematic Casa de les Punxes, hosted by the Catalan Tourism Board on 26 March 2019 in Barcelona and opened by leading stakeholders from Catalonia 2016. Featuring an intervention from Omar Valdez of the UNWTO Academy, the meeting set the purpose of expanding the Region of Gastronomy Award for protecting and promoting food and cultural diversity worldwide. Representatives from Asia, Europe, Latin America and the Pacific, and linking potential candidate regions with those that have already hosted the prestigious Region of Gastronomy Award discussed the relevance of cross-sectorial dialogue for a more holistic approach to sustainability. The Region of Gastronomy Award is not just an accolade for great food but given to regions that work across public, private, third sector and academic sectors to provide a programme of events and projects to raise awareness on sustainable food futures. Dr. Diane Dodd, co-founder of IGCAT, noted the pressing issues of malnutrition and poverty in developing countries that requires further attention. Following presentations from Norway, Spain, Indonesia, Philippines and Australia, she called for a review of the focus areas of the Region of Gastronomy Award so that more emphasis could be put on balanced tourism development and indigenous knowledge, crafts and traditions. It was also agreed that the focus areas will be reviewed at the meeting of the Asean Gastronomy Network in Bangkok in April to ensure that they respond to the needs of regions beyond Europe, where the Award was initially conceived. The meeting also highlighted the importance of working with experts from around the world and IGCAT opened the possibility of collaborating with already established associations working in related fields. As a concrete outcome, the need for more training of trainers for sustainability was identified and IGCAT will take these recommendations forward to the next meeting of European Regions of Gastronomy in Kuopio, 17-19 June 2019. Candidate and awarded Regions of Gastronomy, guided by IGCAT, are working together to raise awareness about the importance of their cultural and food uniqueness and share the long-term aim to: promote a better quality of life in regions; highlight distinctive food cultures; educate for better health and sustainability; nurture creativity; improve tourism standards; and stimulate gastronomic innovation. IGCAT aims to raise awareness of the importance to safeguard and promote distinct food, culture, arts and sustainable tourism assets. This is essential to balance against globalised food trends that are impacting on our planet, health and local economies. IGCAT is a non-profit institute established in 2012, working with regional stakeholder consortiums in the fields of gastronomy, culture, arts and tourism. IGCAT provides the Region of Gastronomy Award and is the official secretariat for the European Region of Gastronomy Platform. Furthermore, the Institute has developed the European Young Chef Award the Local Food Gift Challenge, the Top Visitor Experience and the Food Film Menu project.